June 7-August 4 event brings together artists inspired by Texas painter Peter Saul. (May 31, 2017) -- It's an exhibition that shows off the work of two established artists and two emerging ones, including a UTSA alumna. The upcoming exhibition Daydreams and other Monsters, has been a labor of love for curator and UTSA alumna Alana Coates '12. "This is a museum-level show that was two years in the making," said Coates, who received her UTSA master's degree in art history along with a graduate certificate in nonprofit administration and leadership in 2012. Coates is now the associate director at Ruiz-Healy Art, a contemporary art gallery in San Antonio and New York. Coates says the exhibit, which will be hosted at the UTSA Main Campus, brings together artists from different generations who appreciate and are inspired by internationally acclaimed artist Peter Saul. Saul was an art professor at the University of Texas at Austin and had his work displayed years ago at a gallery in the Blue Star Arts Complex in San Antonio. Coates says Saul made his mark on the art scene in San Antonio and inspired several artists both locally and around the world. Local art collector, Joe Diaz, is loaning his collection of Saul's artwork for the exhibition. "Expect the unexpected. There will be 'lowbrow' imagery, critiques of popular culture and conflicts with inner-self that are presented with wild and crazy colors," said Coates. Artist John Hernandez, who saw Saul's work when it was exhibited in San Antonio, is participating in the exhibition. Hernandez, a San Antonio native, felt a connection because he found Saul's work to have a similar style to his own work. Other artists who felt that connection include Louie Chavez and Megan Solis '16. Chavez is a multidisciplinary artist who has worked in performance painting, sculpture and light installations. He has been commissioned for mural projects by businesses and organizations across Texas. Megan Solis earned her bachelor's degree with a concentration in painting from UTSA last year. She is a multimedia artist with experience in easel, mural and performance painting as well as animation, fashion and sculpture. Solis' work has been on display in San Antonio, Houston and Finland. "I have been working toward this show for about 10 months. I have 17 completely new pieces that I've made," said Solis. "I made small films for the show, and they are much more avant-garde than I'm used to. I definitely stepped out of my comfort zone for this show." Solis says visitors can expect to see similarities between all of the works displayed at the UTSA exhibition. "We are all different ages and have different takes on the world that we are living in," said Solis. "You can tell that we are influenced by the same types of art, film and similar tastes. That all comes out in our art." "The younger artists will be using Internet memes and highlight dating culture. That is something the younger crowd might relate to and pick up on," added Coates. 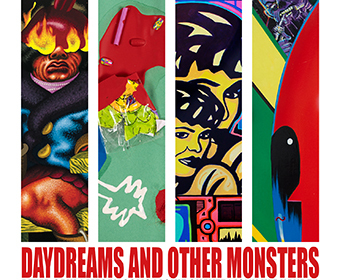 Daydreams and other Monsters will have an opening reception on Wednesday, June 7, from 6 until 8 p.m. An artist talk with Solis and Chavez will be held at noon on Monday, July 17. The exhibition runs from June 7 through August 4 at the UTSA Main Art Gallery on the Main Campus. UTSA's exhibition spaces on the Main and Downtown campuses offer a variety of programs to serve undergraduate, graduate students and the entire San Antonio community. UTSA faculty, students and alumni impact the national and international art scene through exhibitions, publications and other projects. Learn more about Daydreams and other Monsters. Learn more about the UTSA Department of Art and Art History. Learn more about the UTSA College of Liberal and Fine Arts.